I’ve been struggling with Ning all day trying to figure out why when I log in to Ning it tells me I have no networks, but I can log in individually to each of the three networks I’ve joined. (all using the same email) To top it all off I’ve just figured out that I have to create separate profiles for each group I’m in – so in essence I have to upload the songs to my player on three different profiles, and the songs I uploaded last night are not currently showing up on any of my profiles! Argh! Could someone over there fix this!! A game that trains you to stop stressing!! I love it – it’s brilliant! I want it now…. Please?? So many places to be social online – so little time! I’ll admit it, sometimes I have a hard time keeping up with all my sites, not to mention my emails and rss feeds. I’m on MySpace, Flickr, del.icio.us, Library Thing, Second Life, recently started a page on Facebook, yesterday signed up on Ning, and I’ve signed up so many other places that I’ve even yet to try out – like pbwiki, good reads, and bibliophil (the jury is still out on which book site is best)! Still try to check my RSS feeds every so often, and there are five different email accounts between me, work, and school. Plus there are all these great sites out there that I like to check for all the best news and cool trends like Reddit. However, I love all these things! I especially like Ning so far. I find it to be a great avenue for community discussions, and it’s really pretty easy to use. I’m still maneuvering and finding my way around, but after being a part of a discussion in our new Ning network for class I’m ready to suggest it to my co-workers for various projects we’re working on. As discussed on the blog I think it would be a great forum for book/film discussion groups. I’d like to see uses for teens like homework groups, gaming hints, and of course book and film groups. The possibilities are endless! So, I decided to go in search of a library using Meebo. The library where I work uses Meebo, and after a lot of thought I decided it would be very beneficial for me to ‘anonymously’ ask about my library’s service. The IM service at my library, Brookfield Public Library, is managed by the Adult Services department (I work in Youth Services), and I have only rarely acted as a babysitter. Since I already knew a bit about the service and its origins I started with some things I didn’t know. Like, how and when do they plan to evaluate it? The librarian on duty said there was no formal plan in place, but as long as people were using it they would continue to monitor it. She explained that they do keep statistics of how and when it’s used. I noticed that she was typing with entirely correct grammar and punctuation so I asked her if more informal communication, like without caps, was permitted for staff answering im questions. She said that it was proper sentence structure was preferred. I had to ask that, because I never use caps in im… (Even at work!!) Now I know I probably should. We also discussed the types of questions she gets (and I do know it was a female because there are no men on the reference desk…) as well as the types of users. A lot of the questions are basic questions about library hours, or do you have this book – can you reserve it for me, but there are also in-depth, homework-oriented questions and she believes that those questions are usually coming from within the library. So, our patrons using library computers are making use of the meebo widget on the website! 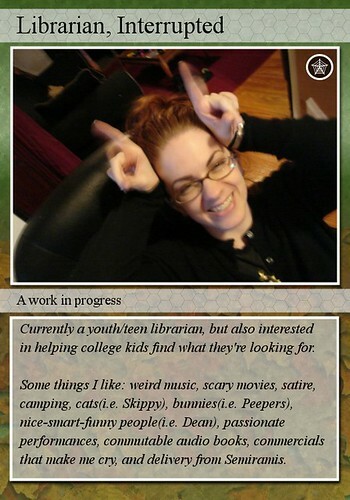 Lookee, lookee I’m on a trading card! My creation, originally uploaded by ariafury. I’ve been meaning to do one of these since some of my friends made them in Michaels 753 class last summer. Sometimes I don’t know where the time goes… Anyway, finally I’m trade-able! As I pondered this and wondered how in the world the Maricopa’s new system could possibly work better, I wandered around the Net reading all about it. Then I found it – Gather No Dust: Doing it without Dewey – the blog that spelled it all out for me, and I felt really silly for not seeing ‘it’ sooner, as blatant as it was right there in front of me. Even with better signs the Dewey numbers will still ‘scare’ patrons. Sometimes they won’t even consider going in to that part of the library. I don’t think it’s really that it’s hard, just that it’s very unfamiliar to many people. Now Maricopa has taken a layout and format that is already familiar to everyone, and essentially reformatted their library. It seems to work kind of like genre sections in Fiction, but instead of Horror you have Cooking or Gardening-Perennials. I like it. I think it could work really well. I do have one suggestion that I think would help it be even more familiar to patrons and also make it easier to find things in a larger collection. At Maricopa they use subject labels and shelve them alphabetically by title – why not add the author’s last name to the label and shelve them the same way fiction is shelved. Browsing is still fully possible, and consistency always makes things easier. Now how do we get everyone else in the world to realize this is a good idea?